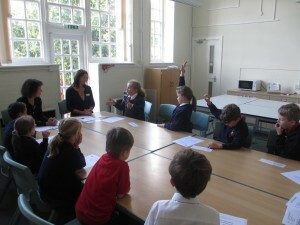 On Tuesday 18th October, the School Council met for the first time this academic year. Topics that were discussed ranged from the possibility of having pancakes on Shrove Tuesday to how were can improve the school’s peace garden. 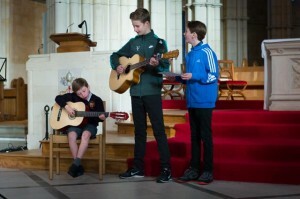 Last summer, the Year 6 pupils took part in an entrepreneurial school project called ‘Five for £5’. Each group of 5 children were given a £5 investment, it was then up to them how they wanted to invest their money. 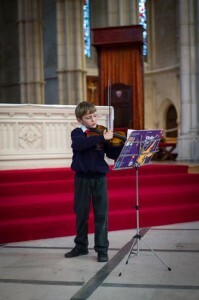 Children had to consider outgoings, profits, costs, even interest from money borrowed. The pupils came up with lots of innovative ideas from baking cakes and making friendship bracelets to selling eggs and charging for a ‘Selfie with a sheep’. The children’s hard work certainly paid off and in total they made over £300. They were allowed to choose how to spend this money. To celebrate the end of term they had a fun filled day at Billycan Camping. This was kindly donated for free by Alex Stewart. After spending some of their money on food and fun for the day, the children decided they would like to donate the money to a charity very close to their heart – The Snowdrop Trust. 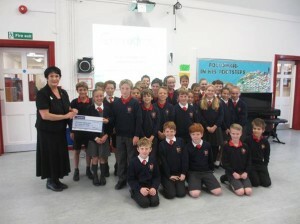 On Thursday 13th October, Di Levantine from the Snowdrop Trust, came into St Philip’s to accept the cheque. It was a lovely opportunity for Di Levantine to visit the school as she has previously supported families within our community. St Philip’s and the other Catholic Schools in the deanery, including St Philip Howard High School, are donating all that is raised during their deanery advent fundraising to the Snowdrop Trust also. Year 3 have visited Pastor Steve at Arundel Baptist Church. The children walked down to the church in the morning. 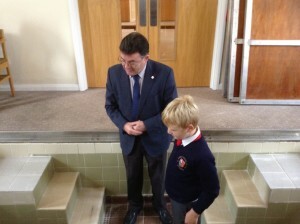 Pastor Steve showed the children the baptist pool. The children got to enjoy a glass of squash and a biscuit and Pastor Steve answered all of the questions that the children asked. 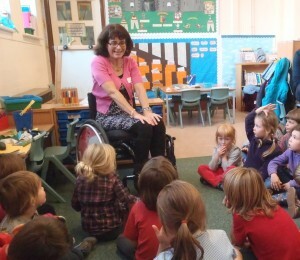 On Wednesday 12th October, Mandy Worne, a former parent at St Philip’s came in to speak to the children about life in a wheelchair and how to overcome difficulties and turn them into a positive. Last summer, Mandy had a cycling accident that left her unable to walk. Since then she has taken part in many sporting events including opening the Chichester Half Marathon, scuba diving, and doing a sky dive! 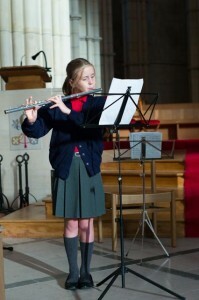 She gave an assembly to KS2 which they found fascinating. She also visited KS1 and spoke to children in class about life in her wheelchair and how to overcome things if they are difficult. 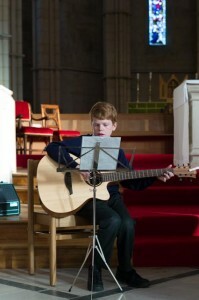 It was a lovely afternoon that really inspired the children and staff alike. 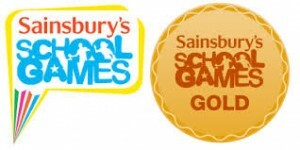 As a school we are delighted to have been awarded Sportsmark Gold for our contribution to Physical Education at school. This award recognises the PE provision both in the Curriculum day but also the extra curricular activities that involve large numbers of our children. Mr Caws, our PE leader, works very hard to ensure as many children as possible are able to participate in competitive sport either within the school or against other local schools. On Thursday 6th October we supported our hot meals provider, Chartwells, by allowing the BBC to come in and film our lunchtime and interview some of our children. The company have won an award for reducing sugar content in their meals by 40%. The children were delighted to see themselves on the news and hear a few of the older children talking so articulately about their views ion the hot school lunches. 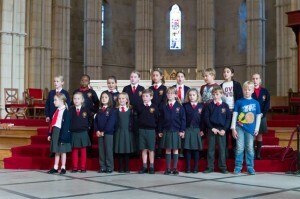 As part of the Arundel Gift Art Trail, the children of St Philip’s sang and performed as part of the exhibition. 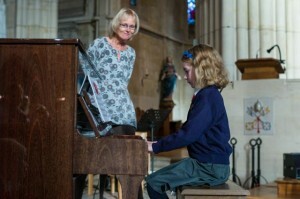 The choir sang together and many children played solos. 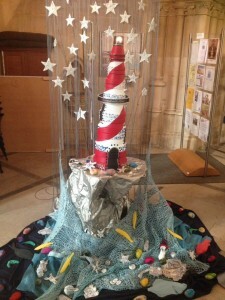 With the help of Mrs Young and Mrs Lawrie, the children had made their own wonderful contribution to the art exhibit with a fantastic lighthouse. To celebrate Grandparent week, the Grandparents of the pupils at St Philip’s joined us for afternoon tea in the hall. They had the opportunity to have tea and cake with their grandchildren. 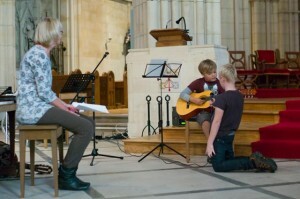 The children then sang for them. 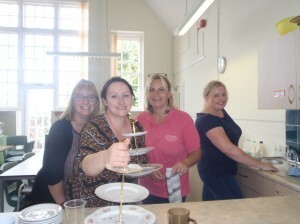 Thank you for everyone who attended and a special thank you to the mums who helped serve the teas and coffees. It was a lovely afternoon that we will be doing again next year. 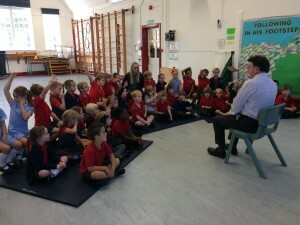 On Tuesday 28th September, Pastor Steve Lomas from Arundel Baptist Church came and gave an assembly to Year 1 and Year 2. It was a lovely opportunity for the children to listen to and learn some of the stories and teachings from the Old Testament. Pastor Steve taught the children a song that they all got to sing along to. 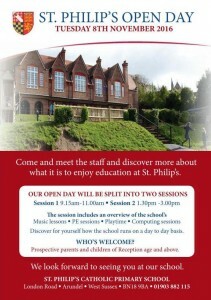 We look forward to him visiting Key Stage Two later this half term.